Khorasani-Motlagh, M., Noroozifar, M., Yousefi, M. (2011). A Simple New Method to Synthesize Nanocrystalline Ruthenium Dioxide in the Presence of Octanoic Acid As Organic Surfactant. International Journal of Nanoscience and Nanotechnology, 7(4), 167-172. M. Khorasani-Motlagh; M. Noroozifar; M. Yousefi. "A Simple New Method to Synthesize Nanocrystalline Ruthenium Dioxide in the Presence of Octanoic Acid As Organic Surfactant". 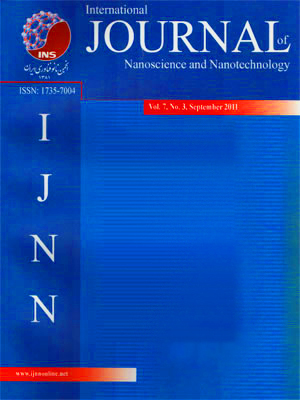 International Journal of Nanoscience and Nanotechnology, 7, 4, 2011, 167-172. Khorasani-Motlagh, M., Noroozifar, M., Yousefi, M. (2011). 'A Simple New Method to Synthesize Nanocrystalline Ruthenium Dioxide in the Presence of Octanoic Acid As Organic Surfactant', International Journal of Nanoscience and Nanotechnology, 7(4), pp. 167-172. Khorasani-Motlagh, M., Noroozifar, M., Yousefi, M. A Simple New Method to Synthesize Nanocrystalline Ruthenium Dioxide in the Presence of Octanoic Acid As Organic Surfactant. International Journal of Nanoscience and Nanotechnology, 2011; 7(4): 167-172. Ruthenium dioxide nanoparticles (RuO2 ) with an average particle size of 50 nm are readily synthesized from RuCl3.xH2O via the precipitation process in the presence of in-situ sodium octanoate as anionic surfactant. The phase composition, morphology, lattice parameters and size of nanoparticles in these products are characterized by Fourier transform infrared spectroscopy (FT-IR), X-ray diffraction (XRD), scanning electron microscopy (SEM).